Pastor Harrison is a native South Carolinian. His Under-Graduate studies were in Political Science and Computer Science. He has continued his studies in pursuit of a Master of Divinity that he is currently working on. He is also working on a degree in Audio Production. He has worked as a Software Developer for more than twenty years developing software for such companies as IBM, American Express, public safety areas such as Police and Fire Departments across the US and other countries. In 1985 he formed Computer Professional Systems, a software consulting company. In 1987 under his leadership and dedication to service his company received the J. D. Power Award for Excellence Service. In 2013 he started SoundFlight Production, an audio recording and production company. Pastor Harrison has always had a love for the gospel from his early Childhood. He was first Licensed by Freewill Baptist Associations, Olanta, SC November 22, 1980 and Ordained by the SRVGC November 19, 2005. He has served as Assistant Pastor, Nazarene Baptist Church, Baltimore, MD under Rev. James J. Thompson; Associate Minister, Zion Baptist Church, Baltimore, MD under Dr. Marshall F. Prentice; Associate Minister, Mt. Olive Missionary Baptist Church, Chandler, AZ under Rev. Thomas E. Wiggins. He was called to Ideal Missionary Baptist Church as Senior Pastor in January 2008. 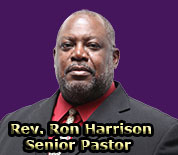 Pastor Harrison is a licensed pilot and certified advance diver. He would rather fly an airplane any day rather than drive a car. He enjoys riding his motorcycle when the weather is nice outside, because he states that he is only a fair weather rider. He also loves playing golf. He is the very proud father of one daughter, Sarah Katherine Harrison. He loves his three sisters, three brothers, nieces, nephews and many other friends and relatives.